I Am America (And So Can You!) is a collection of Stephen Colbert’s thoughts on different topics such as religion, higher education, race, and science. Essentially, it is “the Colbert Report” in novel format. I like “the Colbert Report” and I like Stephen Colbert. But his humor doesn’t translate very well on paper. Obviously I Am America isn’t meant to be the next great novel, it’s really more of a coffee table book or bathroom read. 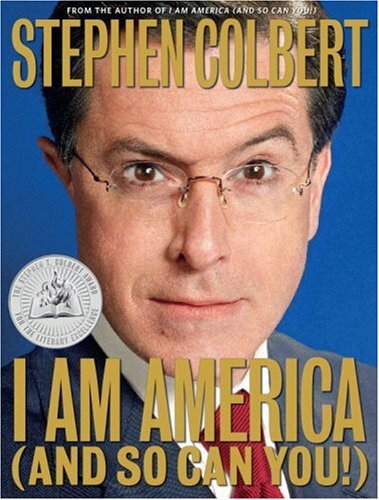 While there are some genuinely funny bits, too much of the book feels tedious, especially the “Stephen Speaks for Me” sections which offer “a chance for average Americans to agree with what [Colbert] think[s].” Some of them are just painful to read and entirely devoid of any comedic value. The use of footnotes gets frustrating (I had this same issue with The Brief Wondrous Life of Oscar Wao), and the margin notes are awkward in eBook format as they don’t always appear next to whatever it is Colbert is commenting on. Tagged i am america (and so can you), stephen colbert, the colbert report.